The powerful 1500-Watt heating element is hidden beneath the stainless floor of the unit, so it's never in contact with water, eliminating build-up of mineral deposits on it and allowing for easy cleanup. 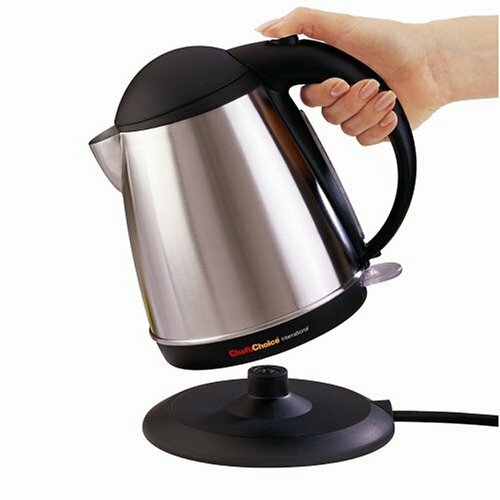 The revolutionary cordless design allows the kettle to be lifted from its base for convenient filling and serving. Handsomely constructed of high-quality brushed stainless steel, the kettle ensures years of service. The automatic shut-off, double boil-dry safety shut-off and lid-lock features guarantee safe use UL listed. We (my wife and I ) liked the pot very much but the handle is a little cumbersome and we tend to hold the pot near the center of the handle where the balancing point is better or near the bottom of the handle (where the balance is off). This kettle replaced my plastic Bodum kettle that finally bit the dust after daily use for four or so years. I wanted to get something that matched the appliances in our kitchen and that could hold a LOT of water. This fits the bill beautifully. It's gorgeous, and of a high quality. I love that it holds a lot of water -- we also make a lot of ice tea, and this is how we make it in the winter time ;) -- so the reviewers who are saying it's too heavy: that's why. It's because there's a lot of water in the kettle. Love, love, love this teapot! I feel like a German and love it! I bought the Chef's Choice for its size and speed at heating water - which the product does do. What I did not expect was the handle to detach from the base of the unit - creating a job for Gorilla glue - which did not work either. So, each time we pick up the unit (as in the picture) the handle separates from the unit creating moments of anticipation - wondering when it will come apart once and for all. This is the first kettle that I have had, although I have used other types at work. It heats the water extremely fast. I like the stainless steel look. The black plastic handles are adequate but I wish they had a better look. It is great that the kettle removes from the base so it is easier to pour. Overall, I recommend this tea kettle to anyone. We are extremely pleased with this kettle. For over a year now, it has faithfully boiled water quickly and easily. Our last kettle was the Braun version and that one began to leak after six months and this was our replacement. I just bought this one again as a gift for my mother. it's good. i've had no problem. quiet. there is no indication that it's done boiling. I purchased this to replace my old electric kettle that was on its last legs. I like the look of this kettle, but there are three problems that make it not worth the price. 1) It occasionally has a high-pitched wistle when it's heating water. Loud and annoying. 2) The area were you fill it with water is narrow and makes it difficult to fill up. 3) The sides of the pot get very hot. Individually, these are all problematic. Together, it makes it a pretty disappointing purchase. Fairly attractive unit with convenient on/off switch, heats quickly. I've had this over two years and used daily. There is also pitting around the top (I've only used water in this unit). The interior rusting is a health issue. Who knows how long it was rusting before I saw the rust-- terrible!! Good product. I use it all the time. Heats water amazingly fast. The only issue I have are that it is not easy to reach in and clean the inside (I have big hands). Keeps boiling for a long time before shutting off (if indeed it does; I haven't waited). Also doesn't switch off when lifted from its base -- when you put it down again, it keeps boiling). Otherwise seems fine. Love this kettle. No concerns of it boiling dry if I forget about it. Boils quickly. Looks good out on the bench, love its portability being cordless. It is one of my wife's favorite appliances. She is not a fan of using our microwave and this product allows her to heat small to medium quantities of water for tea and other uses quickly. This kettle is great for atleast a year. If you use it as much as I do (boiling water at least twice to three times a day), then you can be assured that the hinge at the lid will break, which causes the lid to not close which causes the kettle to happily keep boiling away because the automatic shut-off relies on the lid being closed completely, the partially broken hinge gives you false assurance that the lid is closed, but not close enough.. ! This is after a year and a half of use. Whereas my husbands old screw cap kettle works a charm even after 8 years of use. The good thing about this is that you can remove it from the base and it works like a cordless kettle. I will probably not buy this product again.